(Nanowerk Spotlight) Silica nanomaterials have shown great promise for delivering anticancer and other water-insoluble drugs into human cancer cells. The high surface area, tunable pore diameter, and uniform mesoporous structure of the mesoporous silicas offer a unique advantage for loading and releasing large quantities of biomedical agents. These properties are beneficial for designing stimuli-response drug release and allow mesoporous silica nanoparticles (MSN) to be loaded with a drug. Especially MSNs with hollow and rattle structure show particularly higher drug loading efficiency because the interstitial hollow space can selectively and efficiently accommodate drug molecules. "Numerous studies have synthesized mesoporous hollow silica nanomaterials and explored the possibility of using them as drug carriers," Fangqiong Tang, a professor of chemistry at the Laboratory of Controllable Preparation and Application of Nanomaterials, Technical Institute of Physics and Chemistry, Chinese Academy of Sciences, tells Nanowerk. "But most of this research has focused on in vitro experiments. Few results have been reported on their in vivo behavior and therapeutic efficacy." In what represents a significant progress of in vivo cancer therapy with mesoporous silica nanomaterials, Tang and her collaborators have demonstrated that silica nanorattles – rattle-type nanoparticles consist of a spherical shell encapsulating a freely moving core particle in solvent – show advantages for in vivo enhancement of therapy efficacy and reducing the systematic toxicity of antitumor drugs. 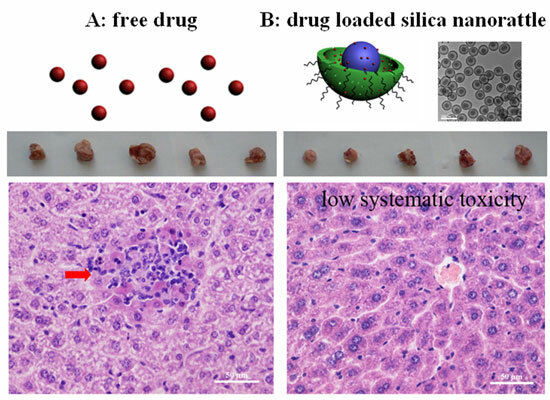 Their recent paper in ACS Nano ("In Vivo Delivery of Silica Nanorattle Encapsulated Docetaxel for Liver Cancer Therapy with Low Toxicity and High Efficacy") is the first report on in vivo cancer therapy with mesoporous hollow silica nanomaterials. "In our study, we carefully considered the possible factors that would influence the in vivo behavior of the nanoparticles, and chose elaborately designed silica nanorattles with mesoporous and hollow structure as carrier of antitumor drug for liver cancer therapy" explains Tang. "Several advantages make the silica nanorattles a suitable drug delivery system, including hollow and mesoporous structure; amino groups on the surface (facilitating the surface functionalization and bioconjugation with biomolecules); controllable size and narrow size distribution; and the ability for large-scale synthesis." Getting the therapy efficacy of nanoparticle-bound drugs right in an in vivo environment is much more complicated and unpredictable than in laboratory in vitro experiments. The size, surface proprieties, stability in blood, and a series of other factors inevitably influence the nanoparticles' in vivo biodistribution and therapeutic potency. Only when systematic evaluation shows irrefutable evidence that the formulation is safe and effective, clinical translation can be permitted. In their experiments, the team loaded the hydrophobic antitumor drug docetaxel into the synthesized 125 nm silica nanorattles. The drug loading amount of was as high as 32% (48 mg docetaxel/100 mg silica nanorattles). "When analyzing the cumulative drug release of docetaxel from the nanorattles at physiological pH and temperature, we found that this drug delivery system exhibited a low initial burst release (within 10% of the loaded amount) within 60 minutes and a two-phase drug release behavior" says Tang. "We attributed the initial rapid release rate in 0-20 hours to the drugs weakly interacting on the outside of the silica nanorattles, and further sustained release with a lower release rate from 20 hours to 5 days to the drugs being electrostatically absorbed in the mesopores and located in the hollow space of the silica nanorattles. About 80% of drugs were released within 5 days." When evaluating the cytotoxicity of the docetaxel-loaded silica nanorattles, the researchers found that, even with tested concentration range even as high as 1 mg/mL, the nanorattles have no obvious adverse effect on cell viability, demonstrating that the nanorattles themselves have no cytotoxicity. Assessing the in vivo therapeutic efficacy for liver cancer, the nanorattles showed an enhanced tumor inhibition rate when compared to the current clinical formulations of docetaxel, Taxotere (72% versus 57%). "The enhanced tumor inhibition of the docetaxel-loaded silica nanorattles may be attributed to the sustained docetaxel release from the nanorattles in vivo and as well as the accumulation of drug-loaded nanorattles in the intra-tumor due to enhanced permeability and retention effect once intravenously administered" Tang points out. "We believe that by further bioconjugating the nanorattles with cancer-specific targeting ligands – for example, antibody, peptide, and aptermer – the specificity of the delivery system for cancer cells and the therapeutic efficacy can be further enhanced." She notes that these nanorattle systems have the potential to be developed as a versatile and robust drug delivery platform for accommodating a wide range of therapy modalities with high drug loading amount, including hydrophobic and hydrophilic pharmaceutical drugs, siRNA, and therapeutic proteins. As for future research, Tang and her team will use silica nanorattles as nanocarriers for other drugs and try to prove the in vivo therapeutic efficacy. They are also planning to thoroughly research the intracellular transport, the biological effect and the in vivo fate of the nanorattles as well as to design strategies to use the silica nanorattle for multi-stage drug delivery and drug/drug or drug/gene co-delivery.